As posted, UEI went through drawdown at the beginning of the month, which was incidentally well within expected parameters, to hit a low of around -3% intramonth. The system yet again proved its long term robustness and clawed its way out steadily to end the month at +2.74%, which isn't too shabby at all. At one point UEI was in the top 20 and for a little while looked as if I was going to win some more Darwinex funds to trade with. This makes it the tenth consecutive green month, something I am absolutely delighted with and would not be so arrogant as to say its what I expected in January. This makes it +43.55% for the year so assuming something catastrophic doesn't happen in November and/or December my stated target from January of 50% looks within sight or maybe just shy. Either way, even if I make no more profit this year I'm extremely satisfied with the consistency and steady profits UEI made this year and would even go so far as to say that so far this has been my best year of trading. Not because I made the most profit ever, but because I have been the most consistent ever. Huge difference. I do however expect UEI to have a losing month at some stage but again am not into making predictions so have no idea when. My advice if you're thinking about investing is just get on with it! As posted before, there were just too many strategies all running at the same time to make any sense let alone profit. I managed to find some time to review the trading behaviour and immediately chucked a few strats away because they simply wren't trading anything close to what they were supposed to. As I mature as a trader I'm less and less enthusiastic about indi led strategies and am much more a price action type of trader. So GRF ended the month at -1.85%, which is a huge improvement on September at least. It actually managed to break positive once or twice, which is encouraging. I also ran my new trend following systems on demo, which started off badly becasue I didn't check the min lot size on several assets before trading them so was taking way too much risk to begin with. But, if there's one thing I like to do its show the "warts and all" and actually now see this as an opportunity to trade the account out of drawdown and make it positive. Personally, if I were someone else looking at it unfold in real time I would trust it much more than some "perfect" equity curve with no drawdown etc. Could you shed some light on the current and sudden DD on UEI? I have had a look and the loss was due to a bearish weekend gap which the system saw as a buy signal due to the mean reversion effect. This did not happen and the system took a full SL. I have never claimed UEI to be the holy grail, such a thing does not exist. I was expecting this to happen at some stage but as I say am not into making futile predictions so was not going to say when. Now it has happened the important thing is to realise why, which I have, and then consider possible remedies, in the context of expectations. This DD is not outside of my expectations. If I find that not trading on a Sunday is a sound decision over the long term then I will apply it. Either way I will post my analysis here for comment. Interestingly, my new trend following strategy is clearly loving the volatility that caused this DD on UEI, which adopts a different strategy/ approach. This underscores the need to diversify in this zero-sum game. At the time of writing this new strategy has currently achieved +3.42% in November, with a further 1.08% floating. Clear! What is noise for a strategy is edge for another! Ok, my attempt to place the current DD into perspective and demonstrate why I am not panicking. Below is the DD chart of UEI over the last three years. It can be seen that this level of DD has been historically hit previously, and for a much more extended period. I took note of this and since the begining of this year been running a different strategy, which has thus far eliminated the amount and length of historic DD seen previously. The chart below shows DD for 2017 and then 2018 after - huge difference and much more comfortable ride for investors (including me). However, to compensate the risk per trade has been increased, otherwise the return would be very poor indeed. As such, the DD is likely to be short and sharp, as has been seen this week. That said, DD will still occur and unfortunately two SLs have come at the same time. This is never easy to accept but my research tells me that this should be quickly eaten up, as the strategy hit a max DD of 20% when running many more pairs so should be lessened running just two. So, the main takeaways for me are to consider no Sunday trading, but also lesser risk per trade. If I get to manage large sums then I suppose the risk per trade thing becomes less important as the important thing is lowered DD and greater consistency. Whilst I’m not a fundamental trader it’s hard to ignore that the Brexit negs seem to be coming closer to a conclusion so I might consider not trading GBPCAD. The question is then how long for?? I was told by Boris Johnson that it would be warmer Caribbean coasts, lied to again! If I get to manage large sums then I suppose the risk per trade thing becomes less important as the important thing is lowered DD and greater consistency. I think that it is important, at any moment and for your investors (independently of the AUM), to lower the DD and get greater consistency. A 12% DD in just 3 days seems something really high. That's entirely understandable and I appreciate your honesty and self examination. The beauty of the markets is that they are so diverse. Everyone has their own comfort zone and tastes, so can and should invest and/or trade accordingly. For example, lots of people were uncomfortable with UEIs long run of ten winning months between Jan and October this year, presumably because it made them constantly feel nervous that a losing month was imminent. Those same people are now probably feeling better about investing since the inevitable DD event, because that's what makes them feel comfortable. I imagine they take comfort in the past history of UEI, believing that this will be repeated in future, something I also believe because I have been trading it so long. Is it a good point to buy? Who can tell, but if that's what makes an investor comfortable holding my Darwin then that's great. As you say, you have to know what you are comfortable with and invest as such. Ok, so UEI took a 12%DD in a couple of days. I accept that is not nice, even for me its owner and with how long I have been trading it, which incidentally is now three years. I have however tried to explain why I don't yet feel nervous in the long term, as this DD is within expectations. If we end the year and 12%DD is the lowest point, does it really matter if it happened over the course of a few days or several months? Would 12% DD have felt better if it were three consecutive months of -4%DD? Or maybe two of -6%DD? six months of -2%? 12 of 1%?!! Be honest, would any of those felt nice? When put in context maybe a short sharp DD is better as its easier to move on from?? Whats that? Don't want any DD? Don't trade or invest then!! its part and parcel of investing and emphasises the importance of diversification. At the time of writing UEI has achieved 26.40% gain this year (less than my personal account). Some would not be impressed with this, but I would be over the moon if I am able to achieve more than 20% annual gain on a consistent basis. Given my personal accounts performance over the past three years, comprising 317 live trades I absolutely believe this to be possible. I initially set a target of 50% for 2018, which perhaps in some way may have meant I was less open to changing the risk settings? Whilst I'm not trying to shift blame, I honestly believe the weekend politicking and chatter regarding Brexit has had a larger than usual effect on weekend gaps, which for this particular strategy has not been so kind. Like I say, I have the benefit of a longer perspective on this strategy and whatever way I look at it I believe it is going to be fine. I cant guarantee it, but my research and personal experience tells me this is very likely. My concern is more on your risk per trade can go up to 6%. 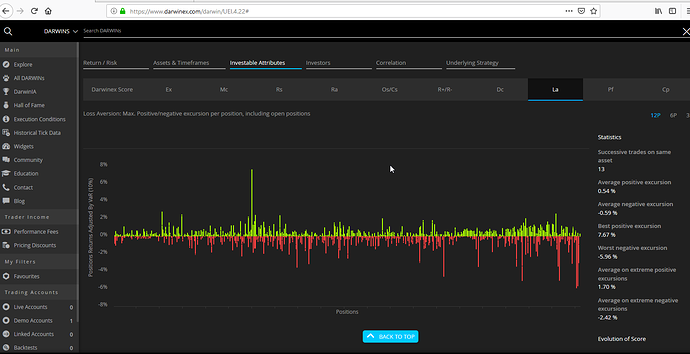 With winrate of 56%, a losing streak is likely, so as we can see your 12% drawdown was only caused by 3 trades. What happen if 5~6 losing streak? Hi @siewvun thanks for your question. The system has never had 5-6 losses in a row in three years. Thats not to say it can't happen but as you'll hopefully agree the data shows this is unlikely. That said, I do believe the Brexit talks are having an effect to weekend gaps, which are occasionally looking larger than usual, so am not trading until Monday London open and also adjusted the risk down significantly. Im not sure what else to do apart from not trading anymore, which isn't an option. I'm not going to let fear get a grip and just try to live with this period as best I can by taking the measures above. @siewvun Hopefully you saw my analysis above? for this one negative (current) event there have been many more outlier positive events and months returning way more than 6% in the past. But we experience those differently don't we? They are longer away from the present (less recency bias) and also positive. Reshare from a post by 60mm on forex factory. "WorldQuant has about 1,000 research consultants from around the globe looking for so-called alphas, signals that predict price movements. It also employs 493 investing professionals who work full time at the firm, according to the people." So, with 1,000 research experts and 493 investing professionals the fund still took a -9.5% hit in October.... the same old caveat applies - "investing is risky". We will never remove risk from the market. This fact is better to accept than constantly try to avoid. The last attempt to remove risk was called Collateralized Debt Obligation, involving Sub Prime Mortgages... remember those? In my experience its much better to embrace risk and learn to live with it or not invest at all. Remember, the returns we are getting are massive compared to the average savings account. You're lucky to get even 1% these days. However, the price to pay is accepting risk. How many times have we read those words: The value of, or income from your investment can go down as well as up and you may not get back the original amount you invested. From this chart, it says >+6% gain is very unlikely. -5%~-6% is a lot more likely. Correct?